Being someone who doesn't actually read the comics, I think I enjoy the movies more than fans of the comic books. I go in, I watch the movie, I have a good time, and I go home. Other people complain that the villain shouldn't have been in the first movie cause he doesn't show up until number whatever, or that the actors looked all wrong for the parts, or that the movie would have been better with certain special effects, or the movie would have been WITHOUT certain special effects, etc.... And I don't do any of that. I enjoy the movie. Or, sometimes, I don't enjoy the movie. But I'm just judging the movie on the stuff actually in the movie, not stuff that's happened for the last twenty years in the comic books. You can tell me all the stuff that's wrong with the movie AFTER I've seen it and enjoyed it and you didn't, but please let me watch it and judge for myself first. 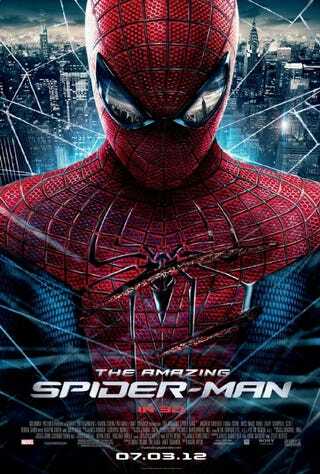 So I haven't much been keeping up with what people are saying about The Amazing Spider-man 2, cause I'm assuming that I'll see it soon enough, and I hate spoilers and all that. But I just realized that I don't remember the first one. I am sure that I saw it, and now that I'm really thinking about it I have vague recollections of some scenes in a sewer with someone who maybe turns into a lizard. But that's about it. That's okay, you don't need to tell me, I can watch it again before we see the new one. But it's just weird that I can't remember it. It was less than two years ago, but most of the time when I try to remember it I get confused and remember something from the other set of movies. Like my brain just can't process another series of Spider-man movies only five years after the first one ended. Or maybe, it isn't the movie at all. Maybe my brain just has been attacked by prions or something.